For your space dinner party theme dress in black and tape stars cut out of tinfoil on your shirt. Eat by candlelight and pretend it is the moon light. 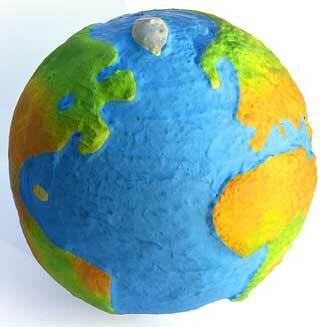 Make a paper mache planet. It is very simple to make a round ball with paper mache and a balloon. Allow to dry and have kids paint their planet however they'd like. Hang above the table or place in the middle of the table. In a mixing bowl blend together cream cheese and shredded cheese. Blend in onion soup mix, lemon juice and cayenne pepper. 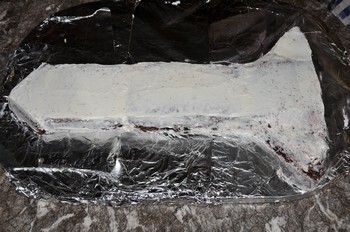 Lay a sheet of plastic wrap or waxed paper on the counter. Sprinkle crushed nuts over the plastic wrap. Form cream cheese into a ball. Place cheese mixture on top of nuts. Roll to coat ball with nuts. Serve with fresh sliced vegetables or crackers. 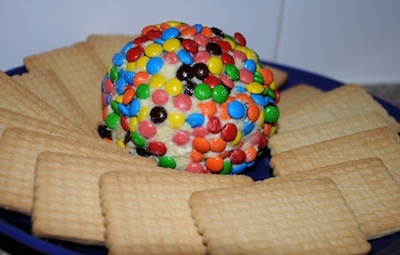 Try a dessert cheese ball if you'd like that instead. Ham or turkey slices cut out with star or moon shaped cookie cutters. Also try cutting carrot slices or peppers out of mini star cookie cutters. Flatten a piece of bread or use a tortilla. 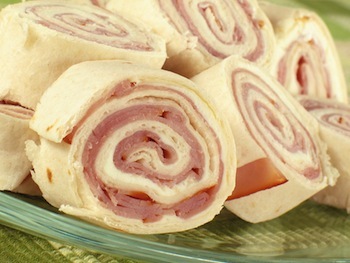 Spread with your favorite filling such as peanut butter and jelly or chicken salad. Roll up and slice. Your sandwiches will look like mini space ships. 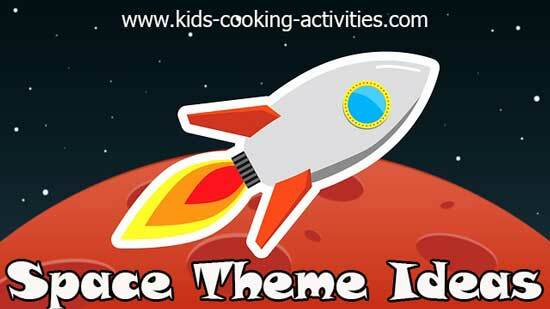 To make a rocket ship or space shuttle, you will need a 13x9 baked recipe that has cooled. Cut it down the middle to create two long rectangles. On your board add foil to the bottom and place one long rectangle towards the bottom of the board. 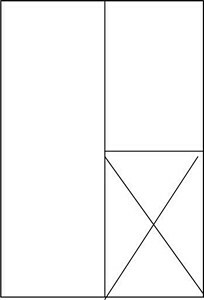 Cut your remaining rectangle in half. Then one of the remaining halves into 4 triangles as shown in diagram. Place the rectangle half above your longer rectangle for the rocket body. Add a triangle for the pointed top. Add another triangle to each side of the bottom of the rocket. Add a crumb coat and allow to sit several hours. Decorate as you'd like adding whatever features you'd like. Decorate with piping stars and smoothed sides. Gum drops and flags added for decorations. 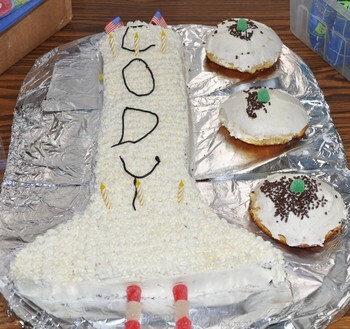 Space ships mini desserts decorated by the kids. Take me back to theme dinner ideas from Space Dinner Party.